I am from Slovakia. I spent in Ireland one school year 8 years ago and now I come back to Ireland to do some work experience, because I just love Ireland. 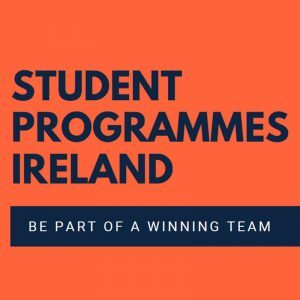 However, before you decide to come to Ireland I would like to share with you some tips and recommendations so that you are better prepared when coming to Ireland as a student who wants to learn English. First of all it is really handy to download a WhatsApp. This app is really popular and you can stay this way in contact with your family, friends and also with Irish people. It eats minimum data and is usually one of the main ways how to communicate quickly. After you arrive to Ireland, you will get an Irish sim card. Make sure, your phone can accept 2 sim card at the same time, or bring 2 phones with you. Also keep in mind to check your flat rate and find your in your home country the terms and conditions for abroad. Do not bring to Ireland your suitcase fully packed. This way you will make a room to bring back home some souvenirs and new clothes. In fact, you wont need many clothes as you will be wearing school uniform most of the time, but make sure, that you will bring some warm clothes and also coat, as it is usually quite cold weather in Ireland. In Ireland you can choose your subjects which you like and also level of difficulty in which you will by study. Irish school system will allow you to do a lot of practical stuff during school lessons so it is not just about learning hard. You will get a lot of homework. Irish students have to learn Irish, so you will have probably free classes during that time. I recommend you to do your homework during free classes. Your host family will make all the meals for you. Although it would be nice if you will prepare some traditional meal of your home country for them. If you would like to make a grocery shopping for yourself, I advice you to shop at Aldi or Lidl. This shops have great value for food which you might appreciate. After a long hours at school, maybe you would like to do some sport. In Ireland it is popular to walk really fast and long distances. If you would like to explore countryside or want to go to school by bicycle, maybe it is all it takes to ask your host parent if you can borrow a bicycle. There are also many clubs which you can join and doing a sport with other people which will support you. I personally joined running club, but you can play rugby, hurling, soccer, do boxing or go swimming to the nearest swimming pool. I guarantee you will feel more comfortable, less homesick and a way happier because of endorphins afterwards. Try to make some Irish friends. At first you will find this hard because nobody would probably pay extra attention to you. You will need to make some effort, make a confidence to introduce yourself, to sit with classmates during lunch time. At the end you will have a great time together. You can experience Halloween and birthday parties, evening on each other houses or going together to some holiday trip. All it takes is a little bit of courage at the beginning.